The new Amazon Kindle Fire is a full-blown Android tablet for only $199. However, by default, Google Maps is not installed and neither is the Android Market, but this doesn’t mean you can’t install Google Maps – you just can’t do it from Amazon’s App Store. The workaround is to use an Android phone which can access the Android Market. And the best part? You don’t need to “root” your phone or Kindle Fire tablet to do this PLUS Amazon doesn’t oppose adding apps in this way (like Barnes and Noble did initially with the Nook Color). The Kindle Fire can install any app in the standard Android APK format and you can find APKs scattered around the Internet on various sites, but it’s recommended to only use the ones found in the Android Market to avoid infecting your phone or tablet. Next, we’ll explain how to move any Android APK app from an Android phone running Gingerbread (Android 2.3 – check your system settings to know for sure) to a Kindle Fire. Using Astro File Manager on your Android phone, change the Preferences of the Backup Directory to “/mnt/sdcard-ext” or “/mnt/external-sd” or “sdcard”, whatever the MicroSD card is called. Click OK twice, then Back three times. Still in Astro File Manager, click “Application Backup” then select Google Maps and any other apps you want to move to the Kindle Fire. Click Backup. The Android APK files have now been copied to your external MicroSD card. Now hook your Android phone up to your PC using a USB cable. Open the drive which appears on your PC, and look for the “backups” folder. Open the “apps” folder within backups. Copy all the APK files from there onto your PC. Now pick up your Kindle Fire and browse to the Appstore for Android to download “Easy Installer” from INFOLIFE. Don’t worry, it’s free. Plug your Kindle Fire into your PC using a USB cable and when it’s drive appears on your PC, copy the Android APK files (Google Maps and whatever else you copied) into it. Now disconnect the Kindle Fire from the PC and open Easy Installer in Apps. You will be able to choose an app to install from a list of the APK files you copied. 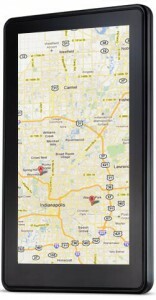 Choose Google Apps and any other apps you want to install and click, “Install Selected Apps.” You now have Google Maps installed on your Amazon Kindle Fire!